Learning the fundamentals of chemistry can be a difficult task to undertake for health professionals. For over 35 years, Foundations Chemistry has helped them master the chemistry skills they need to succeed. It provides them with clear and logical explanations of chemical concepts and problem solving. They’ll learn how to apply concepts with the help of worked out examples. In addition, Chemistry in Action features and conceptual questions checks brings together the understanding of chemistry and relates chemistry to things health professionals experience on a regular basis. 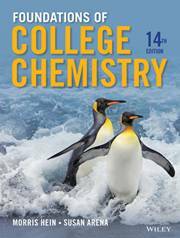 The seamless integration of Foundations Chemistry, 14th Edition with WileyPLUS, a research-based, online environment for effective teaching and learning, that helps track individual student proficiency so that students excel in chemistry. WileyPLUS with ORION sold separately from the text.